TUCSON (KGUN9-TV) - Customs and Border Protection officers made history on Friday for seizing the largest meth load in Arizona port history, according to officials. Officers say they arrested a Mexican national for an alleged attempt to smuggle more than 387 pounds of methamphetamine through the Port of Nogales. Juan Rodolfo Lugo-Urias, 35, was pulled over for further inspection of a tractor-trailer load of bell peppers as he was attempting to enter the U.S., said authorities. Officers say a CBP narcotics-detention canine then alerted to the presence of drugs inside the trailer's front wall and rear doors. 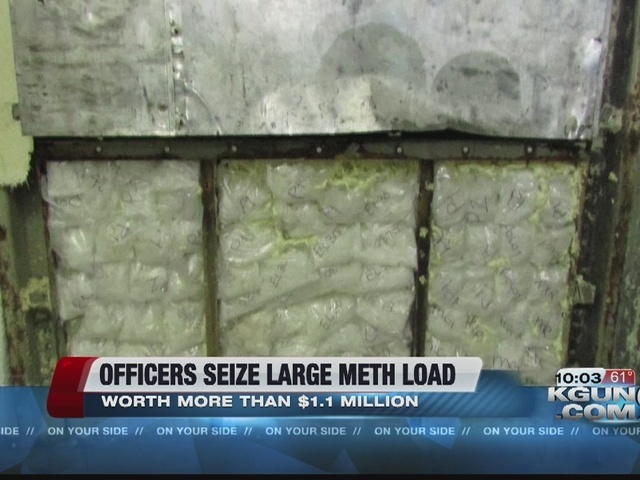 Officers removed nearly 400 packages of meth worth more than $1.1 million. The drugs and vehicle were seized by officers, and Lugo was turned over to Immigration and Customs Enforcement's Homeland Security Investigations. In a press release, Nogales Port Director Guadalupe Ramirez applauded officers for the seizure. "This significant interception is a testament to the vigilance and skills of the dedicated officers at the Port of Nogales," he said.